Laren, Netherlands, 3 July 2015 – Stibo Systems, the global leader in multi-domain Master Data Management (MDM) solutions, today announced that its STEP MDM solution will be implemented at Kramp Group BV, Europe’s largest technical wholesaler to the agricultural sector. Five solutions will be replaced with the standard solution STEP MDM from Stibo Systems. This implementation is of strategic importance for Kramp. The goal is quickly to gather, maintain and publish all the information on its 1.2 million products, along with 500,000 images and drawings, in one centralised database. The organisation’s mission statement is “it’s that easy”, and Kramp wants to make the lives of its customers, business partners and suppliers both easier and more efficient. For Kramp, an important reason for partnering with Stibo Systems is to decrease the time-to-market and become even more customer-oriented. Kramp Group BV is a strategic partner and one-stop supplier of spare parts, technical services and business solutions for companies in the agriculture, landscaping and forestry sectors, as well as for earth-moving and OEM companies. 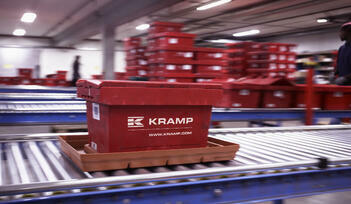 Kramp was founded in 1951 and, since the acquisition in 2013 of Grene, has been a European market leader. The company has 2,600 employees, nine distribution centres and 24 sales offices throughout Europe. For 2015, its revenue is expected to exceed €700 million. For more information, visit: www.kramp.com. Stibo Systems is the global leader in multi-domain Master Data Management (MDM) solutions. Industry leaders rely on Stibo Systems to provide cross-channel consistency by linking product and customer data, suppliers and other organisational assets. This enables businesses to make more effective decisions, improve sales and build shareholder value. During the last 30 years, Stibo Systems has helped hundreds of companies to develop a trusted source of operational information. A privately held subsidiary of the Stibo A/S group, which was founded in 1794, Stibo Systems’ corporate headquarters is located in Aarhus, Denmark.